Hula hooping for fitness and fun is a low impact workout perfect for all fitness levels and ages. 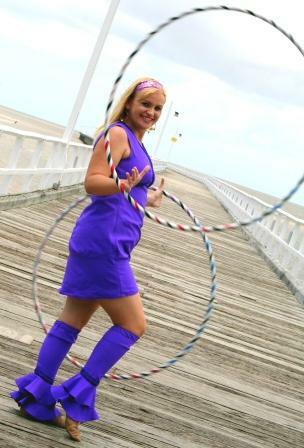 The old fashioned hula hooping has evolved into hoop dancing, a form of total body fitness. You don't have to be a dancer for hoopdancing; the hoop's rhythmic bump on your body educates your body to move with the beat. All you have to do is interact with the hoop and respond to it. Hooping works every muscle group, improves flexibility and coordination, boosts energy levels, and builds strength, agility, and endurance. Hooping is a fun activity that all ages can enjoy together!